Circular economy. You often hear that term when it comes to corporate social responsibility. In the circular economy we deal responsibly with sources, we produce as little waste as possible and reuse as much as possible. At Bredenoord, working circularly has been a natural part of entrepreneurship and it has been the long-term vision of the family business for decades. The combination of the words circular and economy says it all: by being more economical and more aware of materials, energy and labor, you can benefit economically. The Dutch government is aiming for the circular economy. This can only succeed if good business models are the basis for the businesslife. Business models that focus on smart, sustainable designs, reusing and recycling. Ellen MacArthur has developed a clear model that can be a guide and inspiration for companies. Various circular cycles are distinguished in the model. In figure 1 this model is applied to Bredenoord. On the basis of the story of Apeldoorn, we explain the circular economy. As a family business, Bredenoord has been supplying flexible electricity for more than eighty years. With rental, sales and service of these generators, but also with solar panels, battery systems and hybrid solutions. Based on good stewardship, several circular cycles have been developed in the last few years. This circular method and these products have contributed to the success of the company. Interestingly, Bredenoord does this on three scale sizes. The first level means that cycles are closed within the company. The second scale concerns the value chain from raw material suppliers to end users. The third level is actually a very current step right now, in which possibilities are being sought to create partnerships within the ecosystem of relationships that lead to value creation. The circular business model already starts with the design of new aggregates. They must be suitable for intensive use with a long lifespan and efficient transport. Also, they must be as sustainable as possible to produce. If an aggregate has served its years as a rental, the second cycle comes into play. We refurbish (renovate) the aggregates for a second life as emergency generator, for example at hospitals. An emergency power generator is usually not being used as much. Absolute reliability is still essential, and that is guaranteed by design and maintenance. If an aggregate really can’t be used any longer, all useful parts are saved. Bredenoord has one of the largest parts stocks in the sector. Also from machines that are no longer produced. As a result, many aggregates around the world have a longer life span. And of course we recycle all materials, such as metal, oil and batteries. Part of a responsible design is also to see if there are alternatives to fossil diesel. Bredenoord mainly focuses on renewable sources and sustainable fuels and wants to be able to offer these to its customers. First of all, renewable energy: Bredenoord started researching solar energy about ten years ago already. This led to the first ESaver: solar panels that deliver energy to a battery, so that the aggregate only needs to be turned on at peak current or when the battery is empty. Once this prototype was there, we found that the use of a pre-charged battery without solar panels already made the unit a lot more sustainable. In five years, all customers together have saved more than half a million liters of diesel by using the ESaver. And with that, they prevented 2 million kilos of CO2 emissions. Energy storage is therefore an important new circular business model for Bredenoord. It is the way to provide you as a customer with energy, also in the future. And it ensures that we can use aggregates longer in a responsible manner. That's why the next step has now been taken: the Big Battery Box. This is the first large mobile energy storage of 600kWh in Europe. The technology of solar panels in combination with an aggregate is now in use in many places in Africa through our Solar Plants. For sustainable fuels, the aforementioned second aspect of responsible design, Bredenoord has entered into a circular collaboration with suppliers. Since 2015, aggregates can also be ordered with HVO biofuel. This HVO biofuel comes, among other things, from finished frying fat, ie residual waste. Bredenoord took the lead in testing biofuels even before motor manufacturers did. With these tests we were able to guarantee the operation of the aggregates on biofuels and offer our customers CO2-neutral power generated with HVO. For this type of circular entrepreneurship, Bredenoord works together with partners who are transparent about the process and who capture their taken steps well. After all, you can not see or smell if the fuel itself is created in a responsible way. We see transparency and knowledge sharing as essential elements to create a circular economy. Working circularly in the chain is also necessary to meet the expectations of customers. The experience shifts from ownership to use. As a lessor of equipment, of course, you meet it in any case. But customers often don’t really come for one specific (circular) product with required specifications anymore. They come for the solution: have power as sustainable as possible in a place where there is no or no sufficient electricity. The way Bredenoord arranges this, is by leaving it to us more and more. This is called 'product as a service' in circular models. This provides space to combine renewable sources with proven technology and to collaborate with partners in a smart way. There is one basic condition for 'product as a service' to succeed: optimal and flexible service 24/7. Let us have eighty years of experience in just that! Really big circular steps can be taken on the next level; your ecosystem. By looking broader than your value chain with suppliers and customers, smart new circular business models are developable. With neighboring companies, governments, knowledge partners, but also organizations that meet via via and that are working on something completely different, you can come up with new ways to connect cycles. For Bredenoord, working circularly is a 'tool' and not a goal in itself. It is a means to work towards a sustainable, future-proof society. And in the case of Bredenoord with the focus on the energy transition: from fossil to renewable. As a company we want to keep creating value in the bigger picture. Bredenoord is always looking for out-of-the-box ways to attach our circular business model to initiatives of others. 'The internet of things' and big data analysis bring new possibilities to align supply and demand in a new, direct way with each other. For example by delivering full batteries at the exact right time, because a smart machine, that is part of a sophisticated system, has given us a sign. Sharing questions and issues about your (circular) products is also interesting. Perhaps someone in Bredenoord's ecosystem has the solution. The future is open! Developments in the circular economy follow each up other at an increasingly faster pace. Responding to this requires flexibility, being open to the environment and responding quickly to questions from the society. Take, for example, the use of hydrogen. Ten years ago, the Purity was already developed on the basis of this technology. 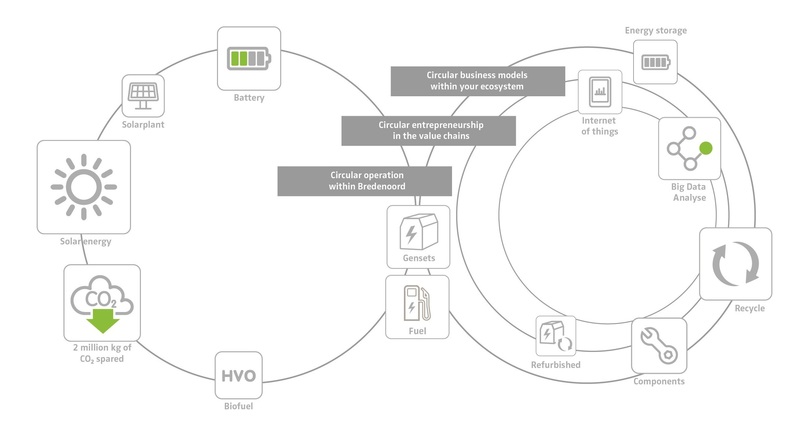 The circular business model that Bredenoord felt coming, didn't take a flight. But hydrogen is now coming up again. In Germany, fuel stations that provide hydrogen for passenger cars are already being built and there are small-scale initiatives everywhere to produce hydrogen in Northern Europe. Bredenoord is therefore actively looking at connections with parties that deal with hydrogen. To share our hydrogen expertise, and to learn from new insights. And we see two very interesting developments, on the normal electricity grid. There are more and more 'prosumers' who are producers and consumers simultaneously by generating electricity themselves, often with solar panels. They want reliable power. This creates new needs and other roles. And it is realistic to expect that as a result of the increase of DC installations such as solar panels, more and more small grids will make the switch to direct current (DC), where currently AC power is still mainly being used. We are preparing for this with our cooperation partners, such as Area 55 and Cleantech Apeldoorn. By already testing in smart grids together, new circular business models can emerge. Bredenoord, we are curious about the surprising ideas of others and we like to look critically at ourselves. We are happy to meet you for an inspiring conversation!